LAWRENCE—After an upsurge in earthquakes was attributed to nearby underground disposal of wastewater during a south-central Kansas oil boom, wastewater injection was scaled back and the seismicity subsided. Then, unexpectedly, earthquake activity picked up farther afield. Although it is unprecedented to suggest injection practices could contribute to fault slippage 55 miles away, as the KGS study does, the amount of fluid injected—along both sides of the Kansas-Oklahoma state line—was also unprecedented. "Wastewater injection increases pore pressure within an injection interval such as the Arbuckle Group, but it can also increase pore pressure in any rocks that are hydraulically connected to it," said Shelby Peterie, KGS research geophysicist and lead author of an article in the geophysical publication EOS that outlines the KGS's findings. "Although pressure change may be large enough to trigger earthquakes on critically stressed faults near a high-volume injection well a short time after injection begins, it may take months to years for increased fluid pressure to travel large distances," Peterie said. The initial seismic upswing in Kansas started in 2013 within a few miles of the wastewater disposal wells, mainly in Barber, Harper, and Sumner counties. The unforeseen influx of earthquake activity farther north around Hutchinson started in 2017. "As epicenters recorded by the KGS earthquake monitoring network progressed north from injection sites near the Oklahoma border to Kingman and Reno counties, it seemed likely they were following a pressure perturbation from the south," Peterie said. "In many other places, bottom-hole pressure is not routinely monitored," Peterie said. "In Kansas, regional monitoring of Arbuckle Group fluid pressure has provided us with strong evidence of pressure diffusion away from the high-volume injection wells in south-central Kansas." 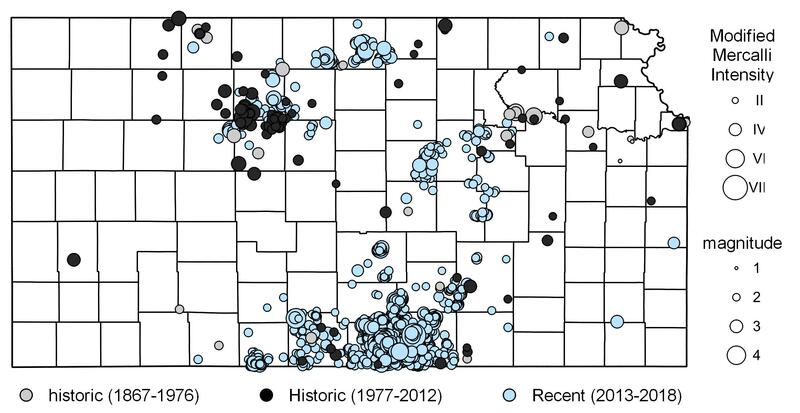 Following a Kansas Corporation Commission order to reduced injection volumes in the area, the number of earthquakes of magnitude 2 or greater in the injection-restricted footprint dropped from nearly 800 in 2015 to 250 in 2016. In contrast, the number of magnitude 2 or greater earthquakes in Reno County rose from five in 2016 to 30 in 2017. In the first ten months of 2018 there were 34. For more information, contact Shelby Peterie (785) 864-2174.